A few trips to Gatlinburg ago, we were prowling around on the Craft Trail and I found a cute little olive oil store called, Zi Olive. While I was sampling every tasty olive oil and vinegar in the store, I was also chatting with the owner. During our conversation, I asked the owner what were her favorite restaurants in the area. She mentioned a few that I was familiar with and then she asked if I had ever been to Buckhorn Inn. Not only had I not been, I had never heard of it. She explained that dinner is one seating, one price, only at 7:00 pm and $40.00 per person. Also, the meal, consisting of four courses, is pre-set. You choose what you want to eat, by choosing the night you want to go. Reservations are mandatory and they stay filled up. You know I was intrigued, so I did a little research. Buckhorn Inn was built in 1938. What? I have been coming to Gatlinburg and the Smoky Mountains my whole life. How did I never hear about this place? Apparently Buckhorn Inn doesn't advertise. Word of mouth is the only way you will hear about this beautiful place. Rooms are available and the Inn serves breakfast, lunch and dinner. I made reservations for dinner. The menu for the night I chose consisted of a roasted garlic and brie soup, green salad with cucumber dill dressing, pork tenderloin with soy citrus mayonnaise, rice pilaf with asparagus and a chocolate hazelnut torte. It all sounded wonderful and it was. We arrived a little after 6:30 and got to hang out in the dining room until serving began, promptly at 7:00. First a basket of bread was brought to our table. Homemade and delicious, it was perfect with the roasted garlic and brie soup that came out next. Then we got a fresh and crispy green salad with cucumber dill dressing. Our entree consisted of pork tenderloin with a creamy soy citrus dressing. It was totally unexpected and scrumptious. The pork was accompanied by rice pilaf, asparagus, grilled peppers and onions and a tasty little cheese toast. We ended our dinner on a sweet note with a chocolate nut torte. It was so good, crispy on the outside, gooey on the inside with a dollop of whipped cream and chocolate sauce. Every single course was well thought out and mouthwatering. So much so, that I asked if the inn had a cookbook for sale. Lucky me. They were selling their third volume of the Buckhorn Inn Cookbook. I was happy it included the recipes for the meal we had just enjoyed. 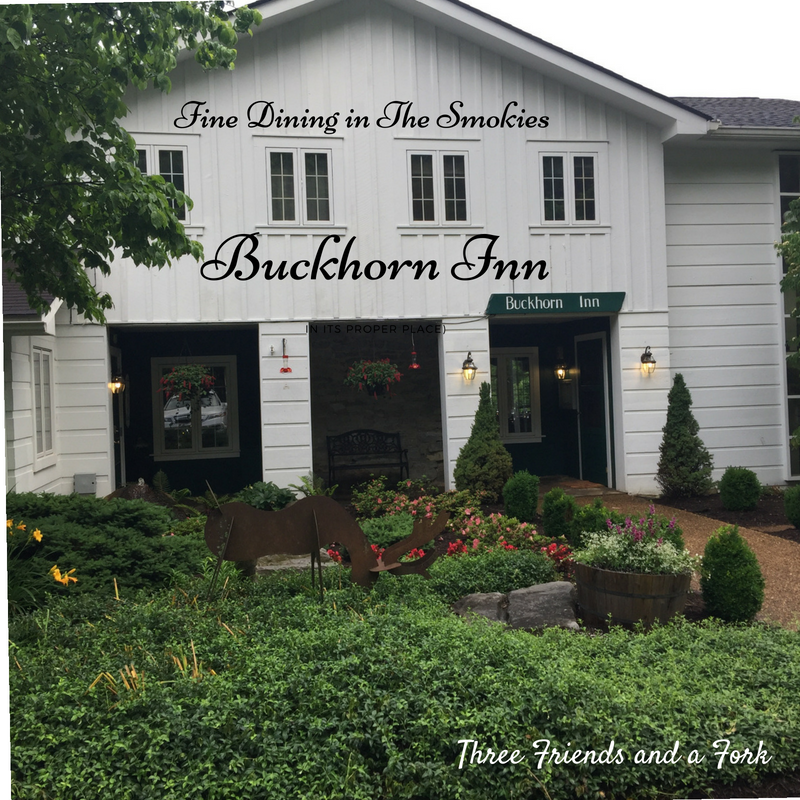 Buckhorn Inn would be a wonderful place to come unwind. It reminds me of some of the horsey taverns and inns in Middleburg, Virginia. Genteel and elegant, the beautiful inn sits in some of the most lush and peaceful surroundings possible. The food is wonderful, too. If you want to get out of the rat race and slow down, I can't think of a more perfect place. Three Friends and a Fork gives 3 Elegant and Delicious Yums UP to Buckhorn Inn. The Inn doesn't advertise, so y'all can thank me later.